Would it surprise you to learn that anyone in San Francisco can arrange to have big name entertainment appear at a private or corporate event or party? It's not only possible, it's easy. Have an upcoming fundraiser at The Fairmont San Francisco? Or perhaps a surprise party at The City Club? Booking Entertainment can help you arrange for an appearance from your favorite band, celebrity, comedian, or speaker to ensure that your event is the success it should be. We can handle not only the contracting of your chosen talent, in the role of an agent, or we can also act as a producer and handle the entire entertainment portion of your San Francisco event as well, right down to the numerous details - sound, lights, equipment, staging, transportation, hotels, and dozens of other performance particulars which are crucial to a live event's success. Booking Entertainment can provide an onsite time to produce the live entertainment portion of your evening, so that you can relax and enjoy the entertainment with your guests, knowing that all is taken care of for you. The easiest way to start is by filling out our Entertainment Request Form. This form will help us gather the information we need to help you start planning your live entertainment for your party or event in San Francisco. One of our agents will contact you within twenty-four hours after receiving the form, to further explain the process and check to see if you have any additional questions. They'll help you select your best choice for entertainment, if needed, and then return with a turnkey price to include everything mentioned above. At this point, you can choose to move forward or not, and if so, the formal offer can be submitted to your talent of choice. 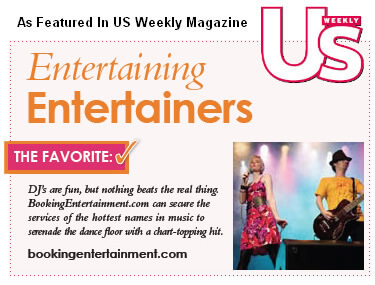 If the act accepts the offer, Booking Entertainment handles everything else, starting with issuing the contracts. To begin booking your entertainment for your San Francisco area event today, just fill out the Entertainment Request Form located right here on our site. With almost twenty years of experience ready to serve you, Booking Entertainment is happy to help you turn your upcoming event into something unforgettable, regardless of your event's venue in the San Francisco area, by helping you to book the biggest names in live entertainment. We will be happy to ensure that your San Francisco party or event is the very best it can be by working closely with you.